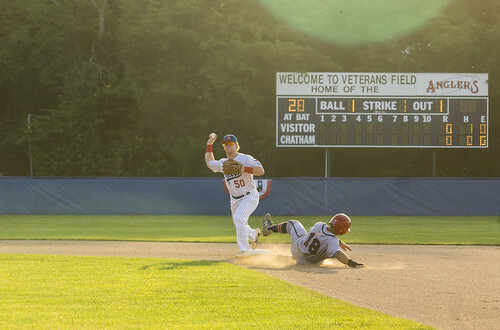 The Chatham Anglers (8-7-2) suffered their fourth loss in six games on Sunday, surrendering a walk-off home run to Cotuit in the 11th inning. After losing three-straight from June 24 to 27, the A’s rebounded to win two in a row with home victories against the Y-D Red Sox and Harwich Mariners. With new faces arriving in town, a Chatham player participating in the College Home Run Derby, and the Fourth of July matchup against Orleans coming up, the storylines surrounding the A’s continue to add up. Here’s some insight from beat writers David Schneidman and Peter Warren on what happened in the past week and what to expect going forward. Of the transactions made in the past week, which ones will have the biggest impact on the Anglers? David Schneidman: Three players made their first start of the summer on Saturday — infielder Rankin Woley (Auburn), outfielder Ashton McGee (North Carolina) and catcher Nick Kahle (Washington). First basemen Michael Busch (North Carolina) arrived in Chatham and warmed up with the team before Sunday’s game at Cotuit, but is yet to be activated. Rankin Woley has made consecutive starts at second base after joining the team on June 26. The quartet of hitters will provide a different look to an A’s lineup that hasn’t surpassed five runs in a game since June 22. Of the new faces, Woley has stood out as someone who can make a profound impact. Anglers manager Tom Holliday praised Woley’s approach to hitting after Saturday’s win over Harwich. "He came up there, and he really swings the bat hard. I like that,” Holliday said. “He has no fear with the bat in his hands. We're gonna need someone right-handed to hit left-handed pitching." While Woley has just one hit in six plate appearances, his presence has been felt beyond the batter’s box. The former junior college standout has looked sharp at second base, recording seven assists. Holliday has used a rotation of players at second base this season, including Branden Fryman (Samford), Jorge Arenas (Stetson) and Austin Wilhite (Georgia Tech), but Woley may be the long term guy at the spot. Peter Warren: John McMillon (Texas Tech) was activated on Sunday and was the only addition to the roster from a pitching standpoint over the past week. McMillon was a relief pitcher his freshman year, making 24 appearances out of the bullpen and picking up five saves with a 1.75 ERA. This past spring, McMillon was used mostly as a starter, finishing the year 5-3 with a 4.02 ERA and a 1.76 WHIP. McMillon is also a two-way threat — he hit eight home runs in 70 at-bats his freshman year — and it will be interesting to see if he gets at-bats or makes starts in the field or as a designated hitter. One other pitcher, right-hander Austin Bergner (North Carolina), is expected to arrive Monday. Bergner is returning for his second summer with the Anglers. In 2017, he was 3-1 with a 1.16 ERA and 1.13 WHIP in seven games for the A’s. He kept his strong form with the Tar Heels this spring as he helped lead them to the College World Series. Adding both Bergner and McMillon will be very important additions to the team’s staff. The A’s have played five games without Spencer Torkelson and Cody Bradford. How have their spots been filled? DS: Since Torkelson’s depature for Team USA on June 25, the A’s have not surpassed five runs in a game and lost three of five. Despite their offensive woes, Torkelson’s role has been filled more effectively than most expected. After a solid start to the season, Tristin English (Georgia Tech) has been incredible in Chatham’s last five games. After hitting zero home runs in his first nine games of the summer, English smacked a long ball in three-straight games from June 26 to 29. He made his debut in the three-hitter role four games ago, and due to his recent surge, Holliday intends to keep him there. Torkelson was the only A’s player to start every game during his tenure on the Cape, and going forward, English will do the same, Holliday said. PW: Filling Bradford’s spot has been much more difficult to quantify than Torkelson’s because of the few amount of appearances Bradford made before he left. Since departing a week ago, three pitchers — Jeff Belge (St. John’s), Hunter Gaddis (Georgia State) and Dan Hammer (Pittsburgh) — made their first starts of the season. Hammer and Belge both put in very good performances as they combined for 8.2 innings, no runs earned and three hits given up. Gaddis struggled in his first official start after posting dominant performances in his two four-inning relief appearances earlier in the year. In addition, Alek Manoah (West Virginia), the A’s Opening Day starter, was shutdown in his four innings of work Sunday against Cotuit. Topping out at 97 mph, the rising junior allowed no hits, walked one, and struck out six batters on just 42 pitches. It was the best pitching performance from a Chatham pitcher this summer. If Manoah can keep that up over the next few weeks as his outing grow longer and longer, he is going to be the face of this pitching staff. Where was Kyle McCann this weekend? PW: Kyle McCann (Georgia Tech) was one of six players selected to participate in Sunday’s College Home Run Derby. Four of the six hitters participating in the event are spending their summers on the Cape. Kyle McCann (Georgia Tech) was the lead-off hitter. In his round, he blasted ten home runs over the fences of TD Ameritrade Park in Omaha. However, he did not advance to the second round as he finished with the lowest total of home runs. Nic Ready (Air Force) won the event, hitting 55 long balls in total, including 21 in the final round. What are the team’s plans for the Fourth of July? DS: In the morning, the A’s will stroll through town center as part of the 2018 Chatham Independence Day Parade, starting at 9:30 a.m. The team will be on Float 41 out of 100. The Anglers will then take on the Orleans Firebirds at 7 p.m. at Veterans Fields. The contest marks the first between the two teams this summer. Chatham and Orleans have faced off on Independence Day for many years, and the rivalry has been especially close over the last decade-plus. The last 11 matchups between the A’s and Firebirds have been split evenly — five wins for each team and one postponement.